You can catch your favorite TV show or watch the latest news while you do your routine on your Horizon Fitness T101 Treadmill. When you are working out in your own home, you are able to do things at once unlike when you are in the gym. You are able to do some multitasking when you have your own exercise equipment. Walking is one of the most effective cardiovascular exercises. If you want to have a full body workout while you are at home, you can certainly do so when you have a treadmill. An exercise machine will be a great asset when you need to stay fit for your sports events, or you want to reduce your weight. This cardio trainer has a very elegant design that allows for easy storage. It folds down to only 10 x 59 inches. Then you can store it away out of reach of children by leaning it vertically on the wall or putting it horizontally under the bed. If it is not folded, the jogging/running platform provides you with enough space to do your exercises comfortably. The LCD console gives you the necessary information you need to know about your routine such as the time, distance and speed. Once you’ve got a working routine, you can easily maintain that using the simple controls in the console. There is a thumb pulse heart rate monitoring system that will watch over your heart beat as you are doing your exercise. This home treadmill is indeed good exercise equipment that will help you save up on gym fees while having the convenience of doing your own exercise routine right in the comforts of your home. This home exercise machine is very helpful in maintaining a healthy lifestyle. It has two integrated workout programs that you can use after you had it out of the box. There is a manual program that you can set according to your own preferences and a weight loss program for shedding away those pounds. While you are working out, you can also enjoy good music. Get your MP3 player and connect it to the Horizon Fitness T101 treadmill. The speakers will let you enjoy your playlist. 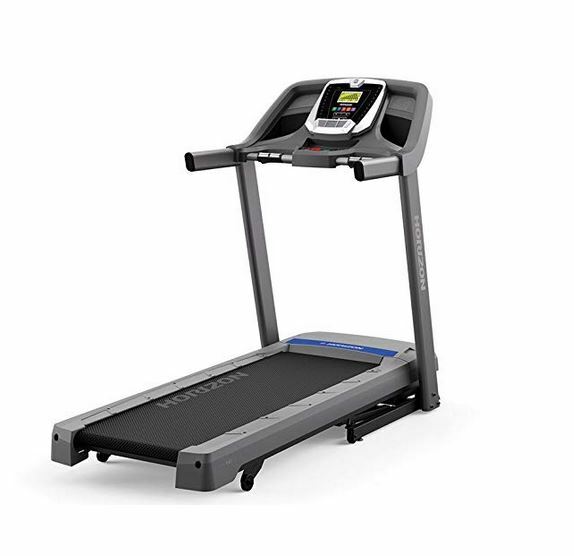 Unlike a lot of the modern versions of treadmills, the Horizon T101 Compact Treadmill is, as suggested by its name, compact in shape. This makes it very easy to fit in tight home spaces. Its size does not get in its way of effectiveness, because it is as reliable and accurate as bigger and heavier models. Built-in audio speakers and lack of initial assembly give it a big push over its competitions. It does not complicate the workout with difficult routines and calculations. It keeps things simple by having just two workout programs, and it has charmed many buyers due to its user-friendliness. As far as cons go, the heart rate monitor has been reported to be inaccurate at times. It is easily fooled into deeming normal vibrations as heartbeats and causes errors in the read-outs. If this small lack of programming can be overlooked, this model can prove to be everyone’s favorite trainer very soon.